Welcome to Snow Flake Glass. 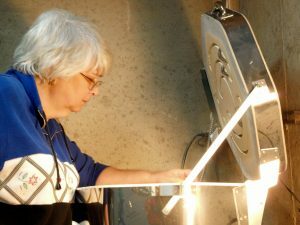 I am Peggy King and I love melting glass. 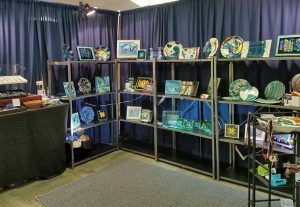 I am a fused glass artist using dichroic, iridized and other colorful glasses to make some of the most beautiful pendants, earrings, trivets, coasters, plates, lamps, pictures and other items that you have ever seen. And they are always one of a kind! Check out art galleries that carry Snow Flake Glass, and which Art Shows and Fairs I will be at this year. By the Way, next time you or your friends are in the market for genuine Swarovski crystal beads, Czech glass beads, porcelain, ceramic or other beads, please visit my sister site. Great prices always on great beads.